They are two All American young men that will inspire you. Zach Ingrasci and Chris Temple embarked on a mission to go beyond their academia studies to ascertain an underground level of poverty, with the hope of ending their sophomore and junior years with a better understanding and hopefully develop the means to eradicate it. Inspired by the “Invisible Children” Project and documentary, they launched an idea that was purely unconventional. The pair subjected themselves to living on less than one dollar a day. According to the "Living on One Dollar "documentary , there are 1.1 billion people in the world attempting to survive off one dollar a day. Zach and Chris wanted to explore this dynamic and hopefully put the pieces together. Accompanied by two other film makers, they set out to reside in a little village in Guatemala called Peña Blanca which became their home for 56 days. Their, the villagers live on approximately a dollar from day to day. The conditions are often desolate and bleak with little to no access to clean water, food and shelter. Their lack of nutrition leads to untreatable illnesses or sometimes much worse. The children in Peña Blanca barely have enough energy to play. This level of poverty is passed down from generation after generation and killing the hopes and dreams of the innocent; they are well aware that they are destined to live like their parents. This level of adversity led to Zach and Chris' research. In order to truly learn about poverty, Zach and Chris felt that they had to get close to the problem as much as they could. They felt that after doing so, either they were going to walk away feeling really guilty, or they were going to take advantage of their resources and hopefully help people. Being subjected to poverty for a short period of time may seem small to many, but it was extremely risky. The filmmaker's health diminished week after week and they lost a tremendous amount of weight. Collectively, the group was consuming 1000 to 1500 calories a day and there was no way to obtain a source of good nutrition. The foursome ate small amounts of food and was sourced the same water as the local villagers. Their place of residence was purely inhabitable while being subjected to innumerable flea bites. One of them even battled E. coli. If it wasn't for the advice of their parents to take an emergency medical kit, the e.coli could have been deadly. In Peña Blanca, treatment pills for e.coli are sold for $25.00. Most villagers are can't afford the cost. In attempt to experience real hardship, the film makers could not purchase treatment. At some point, they felt that they should withdraw from the experiment and retreat to a tourist location to continue their research. Had they done so, they would not have developed the community support and lifelong friendships, that enabled them to survive their remaining days. No one should feel ashamed of poverty. Nor should they feel guilty about their background and circumstances. This is what Zach and Chris came to grips with. They believe that small things could make a difference. There really isn't a simple solution to poverty, nor is there just one resolution. Micro-financing is an idea that they are promoting. They witnessed how a small loan could change the life of a poor person, especially in this particular circumstance. In Peña Blanca, two hundred dollars could literally change the life of an individual. The locals are unable to escape poverty, otherwise. Without an intervention, poverty persists, and is passed on to the next generation. Throughout their stay in Guatemala, they blogged about their ordeal through a video blog on YouTube, where they received 650,000 views. The two year project, “Living On One” caught the attention from folks from all across the nation. An army of support was enlisted through this initial phase. By the time the film was completed, their message went viral. The project “Living On One” extended their initial goal. It has become a full-time job. They were able to raise money for education scholarships for some of the people in the film. 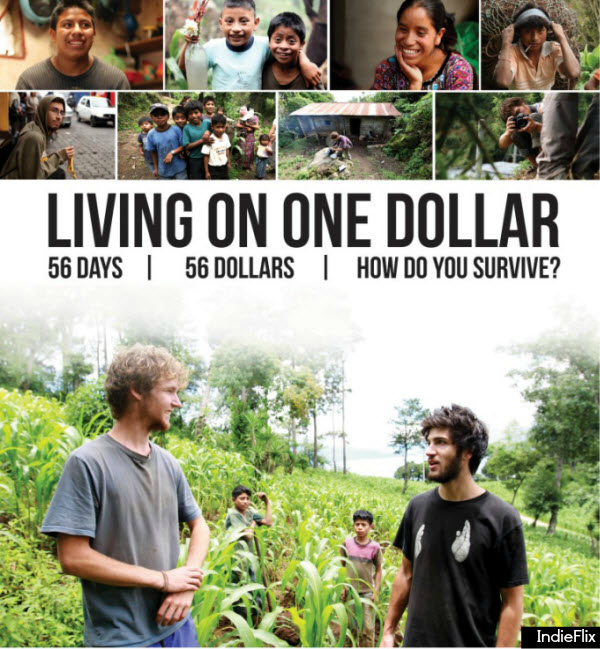 “Living On One Dollar” the movie, received 180,000 views and also raised $21,000 for poverty alleviation through microfinance, via Hulu release in just one week. The filmmakers have been on tours to promote the movie, talk to college students, and advocate a microfinance curriculum. They are continually enlisting support and working to eradicate poverty. On the downside, Chris is still recouping from E. coli. It took approximately 9 months before the illness went way. Though the two are grateful that they are able to wake up to their new jobs everyday. Last summer, they returned to Peña Blanca and visited the villagers, prior to release of the film. They wanted the locals to preview the film and hoped that it respected the way they were being portrayed. Rosa, a leading figure throughout the project aspires to attend school for nursing. In the film, she started a weaving business to pay for school, after receiving a small loan from a local bank. Rosa had started a second business selling schoolbooks to the people in the village, while the filmmakers were away. Her business is thriving. The "Living On One" Project buys fabric from Rosa in support of her business for their t-shirts. Plus the shirts have sold out. Due to her success, she has recruited local women to assist her with the demand. Yet she still work towards attending school. It's women like Rosa that inspire them. Women are at the core of community and family. Chris and Zach feels that women often invest more in these areas, and strengthen the community around them. Furthermore, they welcome women's support for these initiatives. This Interview is sponsored by IndieFlix. You can watch movies like "Living on One Dollar" at Indieflix.com. @womenforaction Completely in love with the initiative behind this!The world needs people willing to go out of their way to foster change! @womenforaction The blog post about Living on a Dollar was inspirational. We need more examples of everyday women creating change locally.